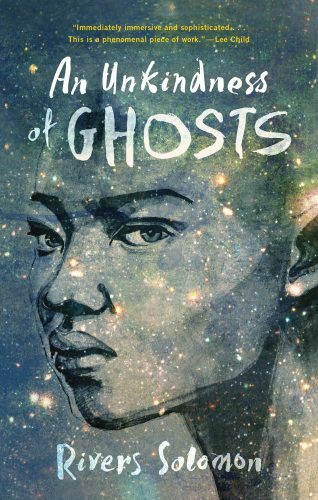 With an Afrofuturist premise grounded in a queer neuroatypical worldview, An Unkindness of Ghosts is the post-Butler novel many of us have been waiting for. Meet Aster, a healer, sharecropper, and rebel who lives in the lower decks of the spaceship HSS Matilda. On a quest to find an apocryphal after-Earth promised land, the Matilda has journeyed for more than three hundred years with what’s left of humankind in its hull. The story begins with two related events—a series of blackouts on Matilda and the ship’s Sovereign taking ill and subsequently dying. Seeing connections between these two events and her mother’s death during another blackout twenty-five years ago, Aster begins to investigate. “I’m chasing my mother’s ghost,” she explains (p. 81). Ghosts—as traces more than as characters—show up repeatedly in the novel: this is a future tied to the past. History for these characters is trauma: “the past swooping in, an unkindness of ghosts” (p. 279). In an interview with The Rumpus, Solomon has said the Matilda is based on the Clotilde, the last ship known to carry enslaved people to the United States. The space vessel’s social hierarchies are organized after the antebellum South, with upper decks reserved for wealthy whites; lower decks for black sharecroppers, each deck maintaining its own cultural and linguistic system: “Twenty thousand lowdeckers and almost half as many different ways of life” (p. 16). For the lowdeckers, life is defined by trauma and resilience. Aster, like her peers, is under constant threat of violence, subject to the whims of the Sovereign’s armed guards. But her close relationship with the Surgeon General (aka Theo) grants her more access to the upper decks—and more negative attention from Theo’s uncle, the new and more brutal Sovereign. Though her capacities as healer set her apart from other lowdeckers, Aster is also expected to show up for work on the Field Decks, an ingenious, remarkably vivid translation of plantation crops to the setting of the spaceship. Solomon’s fields are spherically organized around a Baby Sun—a mechanically engineered replica of the Earth’s sun—and they rotate according to a timed system. Solomon exploits this to great effect in a riveting (temporary) escape scene that illustrates Aster’s brazenness. While Solomon’s worldbuilding is richly developed and finely crafted throughout, Aster’s character is their real masterwork. Aster is black, intersex, genderqueer, neuroatypical, and multilingual: righteous, bold, tender, abrupt, stubborn as hell. Through Aster’s worldview, Solomon centers blackness alongside gender-variance and neuroatypicality, and they do so deftly, through characterization that eschews familiar identity categories. We are expected to see Aster on her own terms. “Girl? Boy?” one of her patients asks her (I refer to Aster with she/her pronouns, as the novel does). Aster responds, “I don’t understand such things” (p. 160). Aster is in-between, an in-betweenness normalized within her community, we’re told: “Due to a broad range of hormonal disturbances, Tarlander bodies did not always present as clearly male and female as the Guard supposed they ought” (p. 20). At times Aster enjoys wearing men’s clothing but this pleasure does not derive from gender expression, necessarily: “It wasn’t the boy part that attracted her. It was the lying part. It was becoming someone else” (p. 272). Aster’s gender expression presents a notable contrast to that of her friend/lover Theo, the aforementioned Surgeon General. Theo understands himself to be a woman, but, given his prestigious status as Surgeon General, is unable to authentically express himself (I refer to Theo with he/him pronouns, as the novel does). Aster and Theo’s budding romance is utterly charming. “You gender-malcontent,” she teases him. “You otherling …. Me too. I am a boy and a girl and a witch all wrapped into one very strange, flimsy, indecisive body” (p. 308). Theirs is a cross-class, cross-racial, wonderfully queer relationship that must be kept under wraps in the context of the ship’s social and power structure. Their romance runs parallel to their collaborative insurgency, obstructed in mostly minor ways, largely in the form of miscommunication. Aster’s cognitive and interpersonal responses are neuroatypical and (though not named as such) suggestive of autism. She does not understand indirection or (most) humor; Theo’s expressions of care and desire confound her and he must learn to avoid figurative or indirect speech. When he throws out the impassioned “What have I done but keep you safe?,” for instance, Aster is bewildered. “Do the meals you take keep me safe?” she asks. “Your baths?… I’m afraid I don’t understand” (p. 40). But where another author might exploit these communication glitches to drive a dramatic wedge between them, Solomon demonstrates the ease of repair: Aster asks for clarification; Theo provides it, and adjusts to Aster’s needs. Aint Melusine, who raised Aster after her mother’s death, describes Aster as “one who looks sideways” (p. 183). This sideways lens governs the novel, producing a story that insists on effective communication and precise narrative logic; and that disrupts some of the more expected tropes of SF adventure narratives. Whereas many heroes are savvy with deception and coded meaning, Aster’s challenge in registering nonliteral meaning obstructs such tropes. Although she has memorized the bizarre journal entries her mother has left behind, she needs her best friend Giselle’s help to understand that they are in code. And when Theo asks her to “answer carefully” during an interrogation, covertly instructing her to lie, she has no idea what he is looking for, and her confusion leads to brutal consequences. Aster is not the only neuroatypical character in the book: Theo is neuroatypical too, described as relying on ritual and repetition. In fact, all of the central characters are both gender-variant and neurodivergent. Giselle, who has experienced a great deal of physical and emotional trauma (as have most of the characters in the lower decks), struggles with paranoia and impulses to self-harm. Aint Melusine is aromantic and asexual, describing herself as “urgeless” when it comes to coupling. But she expresses love fiercely, particularly toward Aster; in this way, Solomon is careful to make clear that aro and ace experience do not necessarily correspond to unfeelingness. Throughout, Solomon’s deftness in representing nonpathological difference is refreshing. Here there is not one neuroatypical character but several; not one gender-variant character but several; and they are in solidarity with one another both interpersonally, in accommodating one another’s needs, and politically, as they work together to resist the Sovereignty. I won’t give away the ending, except to say that it would stand up to a sequel. I hope it does. Aster is one of the most memorable protagonists I’ve encountered in recent fiction, and I have a feeling she’s just getting started—indeed, I kept imagining credits “introducing” Aster as I read, as though she were a young actor in her debut role. Whether or not Aster returns, we will certainly see more of Solomon, whose capabilities as a storyteller promise an embarrassment of riches to come. M. Milks (meganmilks.com) is the author of Kill Marguerite and Other Stories, winner of the 2015 Devil’s Kitchen Reading Award in Fiction and a Lambda Literary Award finalist, as well as three chapbooks, most recently The Feels, an exploration of fan fiction and affect.